July 27, 2007John F. Kennedy Space Center Americas gateway to the universe Spaceport News http://www.nasa.gov/centers/kennedy/news/snews/spnews_toc.html Vol. 46, No. 15 STS-118 crew members ready for August launchNASAs Phoenix to investigate icy regions of Mars (See PHOENIX, Page 2) IN THE Payload Hazardous Servicing Facility, workers guide the heat shield onto the Phoenix Mars Lander spacecraft. Targeted for launch from Cape Canaveral Air Force Station on Aug. 3, Phoenix will land in icy soils near the north polar ice cap of Mars. THE STS-118 crew poses in front of the hatch opening on Space Shuttle Endeavour during the terminal countdown demonstration test, or TCDT. Standing at left is Mission Specialist Dave Williams. Standing in the back are Commander Scott Kelly (left) and Mission Specialist Alvin Drew; seated in the middle are Mission Specialists Tracy Caldwell (left) and Barbara R. Morgan; kneeling in front are Pilot Charlie Hobaugh (left) and Mission Specialist Rick Mastracchio. (See TCDT, Page 4) By Linda Herridge Staff Writer T he first of NASAs Mars Scout missions, the Phoenix Project is scheduled to launch August 3 on a Delta II rocket from Cape Canaveral Air Force Station. On a mission more than four years in the making, Phoenix will make a dramatic landing in the icy region near the north polar permanent ice cap of Mars in May 2008 and spend 90 days exploring the history of the icy water in the soil and monitoring the polar climate. During a mission overview at Kennedy Space Center, Phoenix project manager Barry Goldstein of the Jet Propulsion Laboratory in California said gamma-ray spectrometer results from the Mars Odyssey spacecraft in 2003 revealed near-surface polar ice in the northern hemisphere of the planet. NASA selected the Phoenix Project to be the agencys first scout mission to investigate this discovery. Spacecraft and mission planning began in 2004. NASAs Scout missions are projects that respond quickly to T he STS-118 crew members completed a full dress rehearsal July 17-19 for their upcoming launch aboard Space Shuttle Endeavour, currently targeted to launch Aug. 7. The simulated countdown at Launch Pad 39A concluded the terminal countdown demonstration test, a standard part of prelaunch training which allows the astronauts to try on their launch-andentry suits, learn emergency procedures at the launch pad, and take part in familiarization activities and briefings. With the test now successfully behind them, the seven astronauts will continue training at the Johnson Space Center in Houston. Endeavour has been in place at the launch pad since July 11, and the STS-118 payload  including the S5 truss, SPACEHAB module and external stowage platform 3  is secured inside the orbiters payload bay. Mission managers will determine if the Aug. 7 launch date is achievable during the flight readiness review held July 25-26. Like all shuttle missions, STS118 is about the future: putting the International Space Station a step closer to completion and gathering experience that will help people return to the moon and go on to Mars. But this mission also will see a two-decade-old dream realized and a vision of inspiration completed. Twenty-two years after being selected as Christa McAuliffes backup in the Teacher in Space Project, Barbara R. Morgan will strap into Endeavour as a fully trained astronaut. She is one of five mission specialists in the sevenmember crew. During the mission, a new truss segment known as S5 will be installed on the station. The segment is relatively small and weighs about 5,000 pounds. The piece provides clearance between sets of solar arrays on the truss structure. That doesnt mean, however, that installing it will be easy. Every crew member will play a part. SPACEPORT NEWS July 27, 2007 Page 2 Awards PHOENIX . .(Continued from Page 1) scientific discoveries of the agencys Mars program, Goldstein said. In doing this, we have an opportunity to make breakthroughs in our understanding of the planet. The missions purpose is to study how water is stored and released from the planets polar region and determine the recent history of the subsurface ice and polar region processes. Phoenix will also help to determine the habitability of the ice-soil boundary and search for organic molecules. The spacecraft contains a diverse combination of imaging, robotic arm and chemistry instruments developed for previous missions, including the Mars Polar Lander and Mars Surveyor Program. Phoenix imaging systems include a Mars descent imager, an atomic force microscope, a surface stereo imager, an optical microscope and a robotic arm camera. The robotic arm measures 7.5 feet in length when fully extended. Goldstein said the arm was baked at high temperatures to kill all Earth organisms. Phoenix is equipped with an icy soil acquisition device with a commercial tungsten carbide bit. A digging tool will be used to reach icy soil about 1.6 feet below the surface. Goldstein said excavation of the site will be challenging. The team will select areas to dig after reviewing images of the terrain sent back by the spacecraft. Chemistry lab instruments include the microscopy, electrochemistry conductivity analyzer, or MECA, and the thermal evolved gas analyzer, or TEGA. MECA, which is equipped with a filter, will analyze the content of the soil, while TEGA, which is equipped with a mass spectrometer, will heat the soil up to 1,832 degrees Fahrenheit to determine the organic or chemical elements. Goldstein said the spacecraft will contain 48.5 pounds of instruments, compared to 17.5 on each of the Mars Exploration Rovers. Mission participants include the University of Arizona, JPL, Lockheed Martin Space Systems, KSC and the Canadian Space Agency. Others are the Langley, Ames and Dryden Flight Research Centers, Johnson Space Center and the University of Neuchatel in Switzerland. By Jennifer Wolfinger Staff Writer A standing-room-only crowd was treated to an inside look at the STS-117 mission by the crew members on July 18 at the Kennedy Space Center Operations Support Building II. Commander Rick Sturckow, Pilot Lee Archambault and Mission Specialists Patrick Forrester, Jim Reilly, Steven Swanson and John Danny Olivas narrated videos of their missions highlights while sitting in the first row of the audience. Sunita Williams, who made her way back to Earth after more than 188 days in space, was not present. During the mission, the team continued the important task of completing construction of the International Space Station by participating in spacewalks and delivering solar arrays, batteries and the S3/S4 integrated truss segment. Expedition 15 crew member Clayton Anderson also traveled to the station to assume flight engineer responsibilities. The crew, which launched June 8, had to land at Edwards Air Force Base in California due to STS-117 astronauts share mission highlights inclement weather in Florida. After a 5.8-million-mile mission, the crew members safely landed June 22. They presented footage of the missions four spacewalks, which included deploying and retracting solar arrays and securing an insulation blanket that had come loose. The presentation also showed the astronauts exercising, transferring cargo, and having fun by making a water bubble and piece of red candy float into each other to create an eyeball in space. The crew members also shared some of the ongoing station traditions, such as permanently adding their mission patch sticker to an existing patch collection on a station wall, and affixing their patch on the outside of the hatch with Velcro. As they drifted away from the space station, they took a picture of the orbiting outpost to show how it now mirrors the station on the mission patch. Employees asked questions about how they performed everyday tasks such as shaving and bathing, the conditions onboard, sleeping in space and how they combated disorientation. Johnson Space Centers mock-ups of the station are very accurate. On Earth, you know if your feet are down and your head is up. On orbit, its easy to move and not know it, so wed find a landmark to focus on, explained Forrester. Center Director Bill Parsons concluded the event by presenting the crew with a KSC coin, then invited employees to a gathering at KARS Park II.STS-117 COMMANDER Rick Sturckow talks to members of the KSC work force on the fifth floor of the Operations Support Building II while STS-117 crew members look on (at right). SPACEPORT NEWS Page 3 July 27, 2007 NASAs cutting crew shapes foam shuttle parts STEVE PAGE operates a router that cuts precise shapes in dense foam. The technicians program the router through several techniques. Lohning enjoys bonds with astronauts while on Closeout Crew GREG LOHNING, a NASA quality assurance specialist, has spent 10 years on the Closeout Crew. By Steven Siceloff Staff Writer G reg Dorsey and Steve Page stand behind a panel of glass looking over a computer readout. In the next room, a router carves a perfect channel just like the one the operators prescribed on the computer. The two technicians could be mistaken for woodworkers machining elaborate designs into a cabinet or dining table, and that would be partially correct. They are carving elaborate designs. But their chosen medium is a dense foam called minicell, and the delicately formed and carefully cut designs are not for looks. The cutouts will hold equipment vital for space shuttle missions and flights to the International Space Station. The piece they are working on this time will cradle a light destined for the space station. Without the right packaging, the light would almost certainly shatter just from the vibration of launch. The foam pieces also keep parts and equipment from floating out of place in microgravity, or perhaps bumping into other parts. Working in a stark white shop in the Space Station Processing Facility, five United Space Alliance technicians carve more than 100 pieces of foam for each shuttle mission. It can take up to four hours to detail a piece of the material for use. I dont think weve had anything fly thats been damaged on any flight, Dorsey said. The workers cut holders for equipment flying on several different spacecraft. These guys are cutting the foam for (station cargo modules), SPACEHAB missions, as well as items that fly on the middeck, that fly on the shuttle, said Lori Hillenbrand, the Lockheed Martin senior systems engineer. The work often starts on a digitizer, which is connected to a computer. A designer traces the stylus on the digitizer over the part to tell the computer what it looks like. Then the workers can outline a tray for the router to cut that will fit the part perfectly but still allow an astronaut to pull the item out of the tray. It may seem like a lot of work, but much of the equipment is specialized for use in space or to be used with an experiment that would fail if a critical element came apart in flight. The three different kinds of foam they use is not like the stuff packing stores place in shipping boxes. For one thing, the foam for space missions doesnt fleck easily. Nor will the foam burn, although it will melt. For extra protection, the workers sew Nomex fabric around some of the foam pieces that will stay inside the International Space Station after the orbiter has left. The workers also often find themselves making exact replicas of equipment out of foam, including large pieces such as full-size models of the control moment gyros used on the space station. The models are exact enough to use for tests such as making sure fabric covering designed for the real things will fit right. The workshop has several such mock-ups on hand that give astronauts a good feel for what they will find once in orbit. Theyre very impressed and very satisfied with the work the team does, Hillenbrand said. By Jennifer Wolfinger Staff Writer N ASA Quality Assurance Specialist Greg Lohning has spent the last 18 years working to keep the agencys astronauts, space shuttles and missions safe. To accomplish this, he becomes entrenched in all aspects of a space shuttle mission, whether its installing the seats and experiments, the crew compartments black box, making sure the proper tools and hardware are used, or assisting in the mating of the orbiter, external tank and solid rocket boosters. The 30 days before a mission are filled with intense inspections for Lohning and his 10 to 12 quality assurance teammates. I get to do a little bit of everything. Its not the same thing or same routine. Thats what makes my job fun. I still feel the same excitement I felt during my first launch, said Lohning, who was a U.S. Air Force Reserve aircraft mechanic. Lohning also is one of seven people who comprise the Shuttle Closeout Crew and one of only 25 NASA inspectors to ever hold the position. The most visible aspect of this high-stakes role involves getting the astronauts suited up for a mission and positioned in the orbiter. Lohning regularly participates in rigorous training and studies to be prepared for any emergency. Although hes been a crew member for 10 years, he still reviews contingency procedures for weeks before each mission. Lohnings favorite memories include developing bonds with astronauts years before their missions and later being part of their Closeout Crew. His experiences with Eileen Collins are particularly memorable since she was the first astronaut with whom he developed a friendship, and her STS-93 mission as the first female commander was also his first as a Closeout Crew member. We get to know the astronauts on a personal level. It doesnt get any better than that, he said. Lohning, who will retire Jan. 3, served as a Closeout Crew member for eight space shuttle missions. The STS-117 mission was his last assignment as a member. Astronaut Alan Poindexters prelaunch commentary noted Lohnings commitment and dedication to the astronauts and Closeout Crew. Lohning and his wife, Pam, have a daughter, Teri, and served as foster parents to 19 children. Page 5 SPACEPORT NEWS July 27, 2007 ple te training for August launch MEMBERS OF the STS-118 crew enjoy breakfast together before the next event in their terminal countdown demonstration test, a dress rehearsal for launch. Following the meal, the crew donned their flight suits and boarded Space Shuttle Endeavour for a simulated countdown. From left are Mission Specialists Alvin Drew and the Canadian Space Agencys Dave Williams, Pilot Charlie Hobaugh, Commander Scott Kelly, and Mission Specialists Tracy Caldwell, Rick Mastracchio and teacher-turnedastronaut Barbara R. Morgan. STS-118 MISSION Specialist Tracy Caldwell suits up for the simulated launch countdown that concludes the terminal countdown demonstration test, or TCDT. Sp ecialist Barbara R. Morgan gets help un ch-and-entry suit during a terminal str ation test. The astronauts suit up in the ec kout Building. oo m on Launch Pad 39A, n S pecialist Rick Mastracchio ut tle Endeavour for a simulated n the culmination of terminal on stration test activities. STS-118 MISSION Specialist Alvin Drew (left) and Pilot Charlie Hobaugh look at the payloads installed in Space Shuttle Endeavour while at Launch Pad 39A. Page 6 SPACEPORT NEWS July 27, 2007 Center evaluates BMW hydrogen-fueled vehiclesLogistics engineer Speed earns Toastmaster of Year award WELMON SPEED (right), a NASA logistics engineer, receives the Toastmaster of the Year award from the groups Frank Merceret. By Linda Herridge Staff Writer C utting-edge technology in hydrogen-fueled vehicles has arrived at Kennedy Space Center in the form of BMWs new Hydrogen 7. Through a Space Act Agreement with the automaker, KSC is test driving the vehicles for six weeks. We are pleased to partner with BMW to test their vehicles and explore alternative fuel sources, KSC Director Bill Parsons said. This is using tomorrows technology today. KSC is one of the first organizations to test drive the vehicle in the U.S. The agreement recently was signed by Parsons; Deputy Center Director Janet Petro; Jack Pitney, BMW vice president of marketing and development; and Karl-Heinz Ziwica, BMW vice president of engineering for the U.S. The seeds for a Space Act Agreement with BMW were planted during networking sessions at National Hydrogen Association conferences and the World Hydrogen Energy Conference in Montreal in 2002, according to H.T. Everett, NASA fluids manager for the Propellants and Life Support Branch in the Center Operations directorate. Everett said it is important for KSC to demonstrate how related aerospace technologies can be applied to new technologies to support a cleaner and more sustainable environment. In addition to simply responding to executive orders and federal and state initiatives, KSC leads the agency in the use of available alternative fuel vehicles, Everett said. He said the demonstration of hydrogen-fueled vehicles can contribute to solving some ground transportation challenges of the future. Similar in many ways to shuttle launch technology, the innovative Hydrogen 7 uses a liquid hydrogen storage tank and a hydrogenfueled combustion engine. The Hydrogen 7 has a range of about 150 miles using liquid hydrogen and 310 miles using gasoline. In addition to many standard safety features, the vehicle has an array of hydrogen safety sensors and controls to use liquid hydrogen fuel safely. The luxury performance vehicle can reach speeds of 140 mph and shifts flawlessly from gasoline to hydrogen fuel. Pitney praised the determination and success of KSCs work force. You all dare to dream and constantly challenge yourself, Pitney said. It is remarkable and inspiring and you embody the American spirit of adventure. Ziwica said BMW has a long history of developing hydrogenfueled vehicles. BMW is also providing a mobile refueling station and technicians on site for the length of the agreement. Space Gateway Support, Wyle Labs and United Paradyne operate the government-owned liquid hydrogen tanker as part of the refueling operations performed at KSC.BILL PARSONS, center director, is briefed on the features of the BMW Hydrogen 7. The center is one of the first companies in the U.S. to test drive the alternative fuel source vehicle. By Linda Herridge Staff Writer W elmon Speed, a NASA logistics engineer in the International Space Station and Spacecraft Processing directorate, recently received the Toastmaster of the Year award from Toastmaster Club 3695 at Kennedy Space Center. Speed was recognized for his tireless devotion to the club and his efforts on its behalf throughout the area, said Frank Merceret, the clubs vice president of education and director of research for the KSC Weather Office. I was really surprised, Speed said. I was also very honored to receive this award from my peers. Speed started with NASA as a pre-co-op just out of high school 29 years ago. He has been a member of the Toastmasters organization at KSC for seven years. He served as the club president, an area governor and a mentor to other club members. Speed earned his Advanced Toastmaster Bronze designation in 2006. The engineer organized and implemented a Toastmasters eightweek Speechcraft program for NASA shuttle project managers and engineers last fall, and will serve as co-chairman for a second session this summer. He said the popular Toastmasters program helps to improve speaking abilities and build confidence. (Speed) inspires all of us with his dedication, leadership and hard work, said Merceret, who also is chief of the Applied Meteorology Unit in the Applied Technology directorate. He exemplifies the proactive, nurturing attitude that the Toastmasters organization encourages. Speed is married to his wife of 17 years, Jerinae. He has a son, Willie, 23, and daughter, Simaya, 11. While KSC and the Toastmasters organization keep him busy, Speed still finds time to enjoy scuba diving. There are several Toastmasters clubs at KSC. For more information, visit http:// ksc.freetoasthost.info . 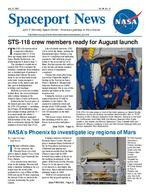 SPACEPORT NEWS July 27, 2007 Page 7 Remembering Our Heritage T he July NASA employees of the month include, from left, Caley Burke, Launch Services Program; Danny Zeno, Launch Vehicle Processing; Frank Kline, Center Operations; and Rebecca Sharek, Office of the Chief Engineer. Not pictured are Phil Gvozd, Information Technology and Communications Services; Nancy Zeitlin, Applied Technology; Kirk Logsdon, Constellation Project Office; Clara Zapata, Engineering; Glenn Seaton, Engineering; Tammy Burlein, Procurement Office; Sam Rogers, Safety and Mission Assurance; Joseph Delai, International Space Station and Spacecraft Processing; and Layla Higgins, External Relations. July NASA employees of the month By Kay Grinter Reference Librarian O n July 28, 1967, Kennedy Space Centers Unmanned Launch Operations  the ULO team  chalked up another success. Orbiting Geophysical Observatory-4, also called OGO-4, launched from Vandenberg Air Force Base into a near-polar orbit aboard a Thrust-Augmented ThorAgena rocket. McDonnell Douglas was the prime contractor for the Thor first stage; Lockheed manufactured the Agena second stage. This was the fourth of six OGO launches, the first of which was in September 1964 from Cape Canaveral. The first four missions provided more than 450,000 experiment hours of data on Earths environment. The TRW-built OGO-4 spacecraft carried 20 experiments designed to study the relationship between the sun and Earths environment during a period of increased solar activity. Particular emphasis was placed on particle activity, aurora and airglow, the geomagnetic field, the neutral and ionized composition of the atmosphere, and the electromagnetic energy sources contributing to ionization and atmospheric heating. Experimenters included universities from Michigan to40 years ago: Kennedy team manages launch for fourth Orbiting Geophysical ObservatoryULO team was Wendell Cortright, point man on the West Coast for the Agena launches. From his home in Clinton, Ark., he recalled: I always lived in Lompoc. When there was an Agena being readied for launch, I had daily telecoms with management at the Cape, and I traveled to Kennedy about twice a year to attend meetings. At the time I retired, I was working on the shuttle program at Vandenberg. NASA had a plan to develop a launch capability for shuttle missions from Space Launch Complex-6 on the base. On Oct. 23, 1969, OGO-4 was turned off but was briefly reactivated in 1970 to make some additional observations.THE FOURTH Orbiting Geophysical Observatory was launched July 28, 1967. The mission was managed by Kennedys Unmanned Launch Operations team. Arizona and New Hampshire to Iowa, as well as Stanford, Dartmouth, Rice, CalTech and Flinders in Southern Australia. There were government and corporate participants, too. Some members of Kennedys ULO team lived in California yearround. One of them was Bud Thacker in the Pacific Launch Operations Office, NASAs interface with the Pacific Missile Range, managed by the U.S. Navy. From his home in Tampa, he recalled: When I joined NASA in 1962, the office was located at Point Mugu. After the Air Force took over management, the range was renamed the Western Test Range to mirror the name of the Eastern Test Range along the Atlantic, and the office moved to Vandenberg. We provided spacecraft and vehicle support for all NASA launches from the West Coast. Thacker relocated to Brevard County as manager of ULOs Delta launch operations division in 1977. Another Californian on the Some members of Kennedys ULO team lived in California year-round. We provided vehicle support for all NASA launches from the West Coast, Thacker said.